What does Godzilla's name mean? 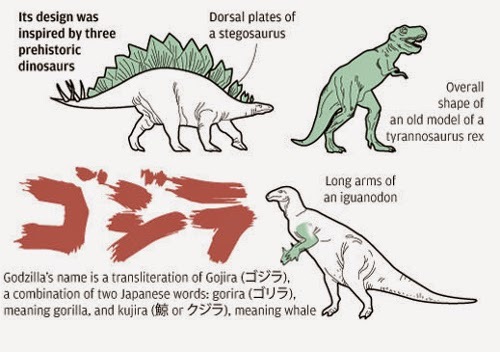 What dinosaurs inspired Godzilla? Who are Godzilla's greatest foes? 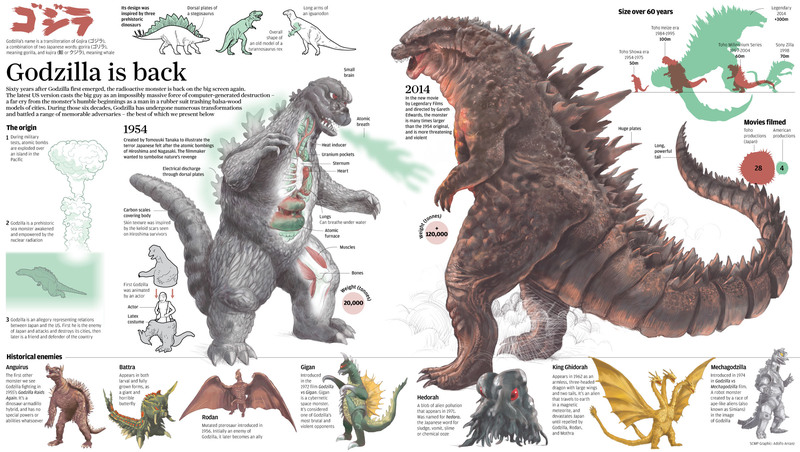 Just in time for the release of Godzilla (2014) on Blu-Ray and DVD, artist Adolfo Arranz created this really cool graphic about the King of Kaiju. It was originally created for the South China Morning Post in Hong Kong. The only thing I could find wrong is the claim that the new Godzilla is 300 meters tall. Empire's semi official infographic says it's a little over 100 meters. What did you think of the infographic? Three hundred meters would be close to a thousand feet. Don't think he was quite that big. The girth of the new Godzilla is imposing enough. This is a fun site! Is DC Beating Marvel at Diversity in Movies?